My sister has returned with a refreshing and healthy beverage to kick off your weekend. 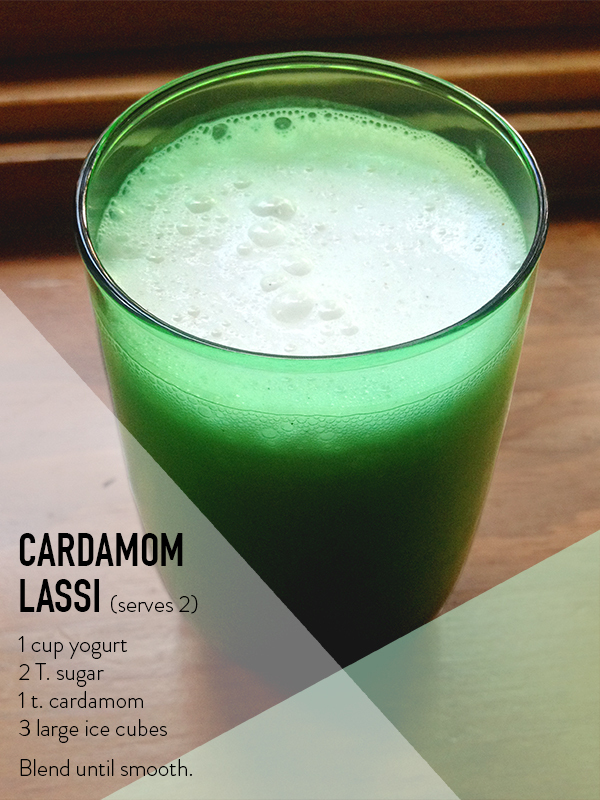 If you're still recovering post-July 4th, this Cardamom Lassi is the perfect solution! Also, don't forget to check out Rebecca's blog here. A lassi is a cold yogurt drink. As far as I can tell, there are as many recipes for a lassi as there are people who drink them. Some are smoothie-esque, some are savory, some use water, some use ice, etc. I like it tart but you could add more sugar if you want. Or less. Or use honey. Mango is a more conventional flavoring. Try adding banana instead of sugar. Whatever. Oh ... and I suppose you could add some kind of booze to make it a cocktail - but why? Turn off the glowing rectangles and take some deep breaths. Look around you. Read a book. Talk to people you love about things you love. Plan your next move. That's what I'll be doing tonight. No booze required.